In a small saucepan, simmer the Balsamic Vinegar over low heat until reduced to about 1/4 cup. Set aside. Preheat oven to 425 degrees F. Heat the olive oil in a large, heavy skillet with an oven proof handle over medium-high heat. Smash the garlic cloves and put them in the pan and scatter them over the oil and cook until browned, about 2 minutes. Season the chops with the Herbes de Provence Olive Oil, salt, and pepper and lay them in the pan. Cook until the underside is browned, about 6 minutes. If the garlic cloves become more than deep golden brown before the chops are fully browned, remove from heat and set aside. Turn the chops, tuck the onion wedges into the pan and continue cooking until the second sides of the chops are browned, about 6 minutes. Season with salt and pepper. About half way through browning the second side, tuck the pear wedges in between the chops. Stir the Lambrusco Wine Vinegar and honey together in a small bowl until the honey is dissolved. Pour the wine vinegar/honey mixture into the skillet and bring to a rolling boil. Return the garlic cloves to the skillet if you have removed them. Place the skillet in the oven and roast until the onions and pears are tender and the juices from the pork are a rich, syrupy dark brown, about 30 minutes. Once or twice during roasting, turn the chops and redistribute the onions and pears. Handle the skillet carefully-it will be extremely hot. Remove the skillet from the oven. Place a chop in the center of each warmed serving plate. Check the seasoning of the onion-pear mixture, adding salt and pepper if desired. Spoon the pears, onion and pan juices around the chops. 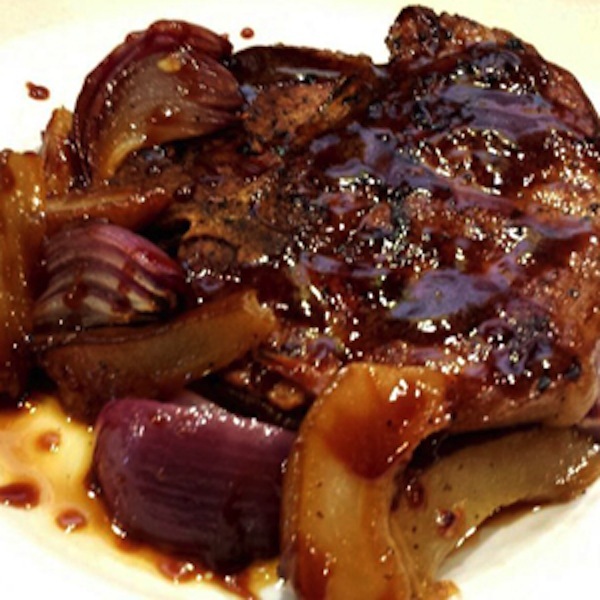 Drizzle the Balsamic vinegar reduction over pork chops and pears. ENJOY!